Contents: Casey at the Bat; or, The Fate of a “Rotten” Umpire (1899), How the Office Boy Saw the Ball Game (1906), His Last Game (1909), The Ball Player and the Bandit (1912), Hearts and Diamonds (1914), One Touch of Nature (1917), The Busher (1919), Headin’ Home (1920), Casey at the Bat (1922), Felix Saves the Day (1922), Butter Fingers (1925) and Happy Days (1926). including Headin’ Home (1920), black & white, 73 minutes, not rated, Casey at the Bat; or, The Fate of a “Rotten” Umpire (1899), black & white, 1 minute, not rated, How the Office Boy Saw the Ball Game (1906) [incomplete], black & white, 5 minutes, not rated, His Last Game (1909), black & white, 12 minutes, not rated, The Ball Player and the Bandit (1912), black & white, 12 minutes, not rated, Hearts and Diamonds (1914), black & white, 33 minutes, not rated, One Touch of Nature (1917) [exerpt], black & white, 18 minutes, not rated, The Busher (1919), black & white, 55 minutes, not rated, Casey at the Bat (1922), black & white, 6 minutes, not rated, Felix Saves the Day (1922), black & white, 7 minutes, not rated, Butter Fingers (1925), black & white, 16 minutes, not rated, and Happy Days (1926), black & white, 14 minutes, not rated. Kino International, K529, UPC 7-38329-05292-8. One single-sided, single-layered, Region 0 NTSC DVD disc and one single-sided, dual-layered, Region 0 NTSC DVD disc, 1.33:1 aspect ratio image in full-frame 4:3 (720 x 480 pixels) interlaced scan MPEG-2 format, ? Mbps average video bit rate, ? kbps audio bit rate, Dolby Digital 2.0 stereo sound, English language intertitles, no foreign language subtitles, chapter stops; two-disc DVD keepcase, $29.95. Release date: 3 April 2007. 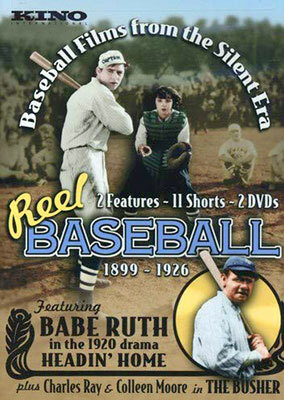 This DVD collection of short and feature-length baseball films has been transferred from film elements provided by Dennis Atkinson, Film Preservation Associates, the Larson-Casselton Collection, the Library of Congress, and Lobster Films, Paris. The films are accompanied by music composed and performed by David Drazin, David Knudtson and Ben Model. We highly recommend this collection of baseball-themed films. 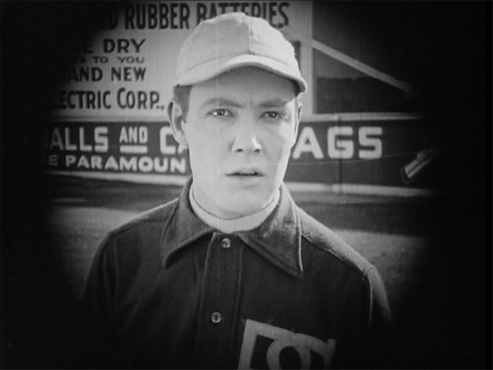 Other BASEBALL FILMS of the silent era available on home video. Other SHORT DRAMA FILMS of the silent era available on home video. Other SHORT COMEDY FILMS of the silent era available on home video.